You've likely read many articles about the benefits of data within business and you understand how useful it can be in your decision making processes. Data helps lead you to informed strategies, decisions and paths. 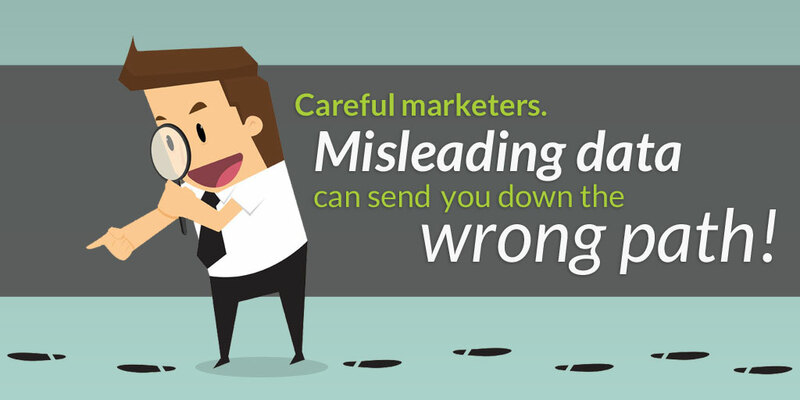 The problem is, data can also be used just as easily to mislead you. This isn't to say that users of data are changing the numbers. It's more about context and understanding what you're looking at and how it got there. When data is being analyzed and put to use in the business world, it can have a large impact on your bottom line, so it's important to make sure that you're critical of what you see and not just taking it at face value. A great example of misleading data can be found within a recent article in the Toronto Star, regarding the call for landlord licensing in Toronto. The numbers you see presented in big bold blocks lead you to believe that the tenant group providing the data (ACORN), was highlighting a shocking, if not very disturbing trend. Doesn't that sound terrible? Why, it might even ignite a widespread call to action! Here's the problem: The Star was quick to point out that ACORN represents 20,000 tenants in Toronto. Out of 2.6 million T.O. residents, that's quite a small group. Read even more closely and you learn that the group only received survey responses from 174 of their members. This means 144 people with a reported cockroach problem, are representing approx. 2.15 million other Toronto residents that supposedly have the same problem. This is highly unlikely and a sample this size is hardly significant and should be viewed with skepticism at best. Did you take my statistic on population representation at face value? Or did you ask yourself if my population calculation included homeowners, renters and temporary residents? The fine print is: I used the general population of Toronto, not just renters. While my point behind the numbers is still valid, my actual data likely misled you. It's that easy. It's not always a case of others presenting numbers and leading you towards a particular conclusion. You also have to be sure that you're not misleading yourself. This means you need to ask the right questions and have a good understanding of which metrics are important to you. For example: Evaluating an online listing website (ILS)- which is more important: How many site visitors the ILS gets OR how many site visitors they send to your website? An ILS can have an impressive number of visitors to their site. Think of all those eyes on the ILS YOU work with! But, how are the users being directed to your website? It's not helpful if there are millions of monthly visitors to your preferred ILS, if they aren't looking at you. By not looking at the data and the context critically, you run the risk of selling yourself on a service that looks good on paper, but doesn't work for you in real life. Mining the data and interpreting the numbers to find the results you want also runs the risk of being misleading. Make sure you're being objective and honest in your interpretation of the data. One way to avoid doing this, is to look at your data insights in a different form. Try graphing your data instead of looking at just the numbers. You might find it reveals something completely new to you- by creating a visual, anomalies and patterns become easier to spot. At the end of the day, if you take your time, are critical of the data you receive and ask yourself the right questions, you'll find yourself led in the right direction.